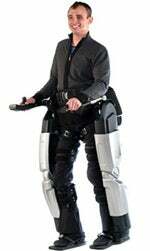 Rex's potentially life-changing solution, known as the Rex, is a robotic exoskeleton of sorts, and is the end result of seven years of development. The new technology aims to offer wheelchair users a way to walk once more, thanks to the help of robotic legs. Rex Bionics detailed that once a wheelchair user transfers to the Rex and is secure, they can control their own movements due to an attached control pad and joystick, even allowing the user to walk up stairs. All of this heavy-duty movement is powered by a long-life and lightweight rechargeable battery, which is said to be designed and ready for a typical days use. The Rex is expected to be available in New Zealand before the end of the year, with an international launch due sometime in 2011. For more Geek Tech updates follow Chris Brandrick and GeekTech on Twitter.